The moon in Capricorn people are industrious people who get emotional whenthe situation is not in their control. 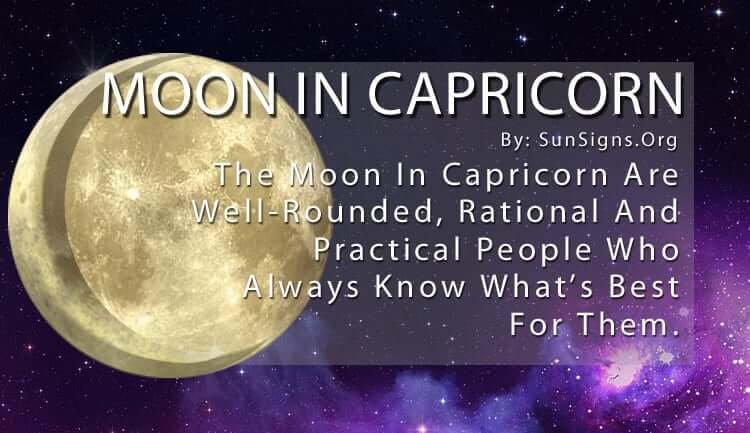 Even though Capricorns are known for being cool and collected, the Moon in Capricorn causes them to have emotional outbursts that they simply have to learn to control. They are well-rounded individuals. But they also want to be revered and respected and put themselves under a lot of pressure because of it. Image and status are very important to a Capricorn star sign. Their main goal is usually to climb up the corporate ladder. Their career is their main priority and they are one of the most hard-working signs in the zodiac. But because of this, they put a lot of value into acquiring power and status with material possessions. And that can be exhausting. To accomplish the most in life, moon in Capricorn zodiac sign plan and organize every aspect of their life. Capricorn Moon, especially, map out things like their career, family, and retirement to live in a way that will help them to reach their goals. This makes them incredibly stable people and one of the most reliable signs of the zodiac. They are often seen as pillars of strength. Others know they can lay their burdens on a Moon in Capricorn and they will carry them with no problems. This is no surprise seeing as they are symbolized by the goat. They will climb any mountain to obtain their next goal with no complaints. Capricorns will not allow the stress to break down the walls they’ve built around their emotions. This means they sometimes sacrifice their health to ensure everything goes according to plan. But their tenacity usually gets them through the worst of any situation. It keeps them cool and confident. With the Moon is in Capricorn they can feel quite stressed under the weight of the world that they’ve placed on their shoulders. For them to feel comfortable and secure, they need to be respected and valued by others. To obtain this the Capricorn moon sign people feel the need to be active and productive at all times to appear to be important. They consider themselves to be rational and practical people, They think they always know what’s best for them and those around them. The only problem with their efficiency is when something happens that is out of their control. They are not the most adaptable people, and the Moon in Capricorn makes them downright stubborn. They often miss out on fun gatherings or light social outings because they are so fixated on keeping everything in their life under control. While they do this to minimize the amount of chaos in their lives, they also minimize the amount of enjoyment in their lives. Since the Moon represents our feelings, emotions, desires, the Lunar Capricorn sign magnifies their need to be the best at what they do. And with that much responsibility comes the pressure of always being thoughtful. This also means always being capable and always being there for others. This kind of burden can be costly to the physical, mental and emotional well-being of any person. And the Capricorn in Moon can be so obsessed with keeping the little details in check that they miss the bigger picture. It’s up to their friends, family and loved ones to bring them out of their tightly sealed existence for some fun once in a while. As long as they can let loose from time to time, it makes their efforts for a clean living worth it.